Surprise! I'm not quite done with my posts from our trip to Salem though, sadly, I am done with the Hawthorne Hotel part of our trip minus any hair-raising, spine-tingling experiences to speak of - just a lot of oddities that all strung together might at least make you sit back and say "Hmmm..." I promise to go back at some point and try for an honest-to-goodness I-need-to-go-change-my-drawers experience, okay? I would be more than happy to do that for you, my readers, as that's just the kind of dedicated blogger I am ... plus it gives me an excuse to go back to a fantastic hotel! After we checked out of the hotel, Jamie and I had most of the day to kill as Amanda wasn't going to be finished up at Montserrat until later in the evening. Juli had been nice enough to let us hold onto the passes for the Peabody Essex Museum just in case we had the chance to go back and tour the Yin Yu Tang house but before we thought about doing that, there were some places in town that I wanted to try to get some pictures of. 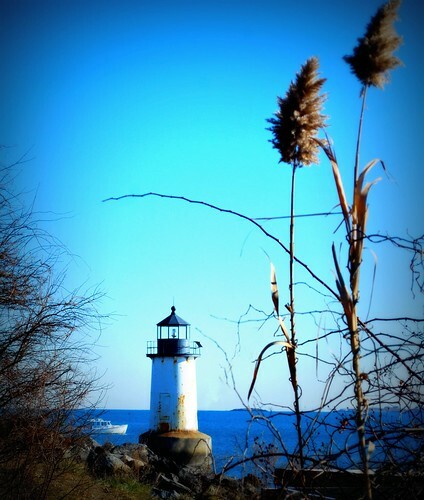 It was a beautiful day and there were lighthouses nearby - I just knew it! 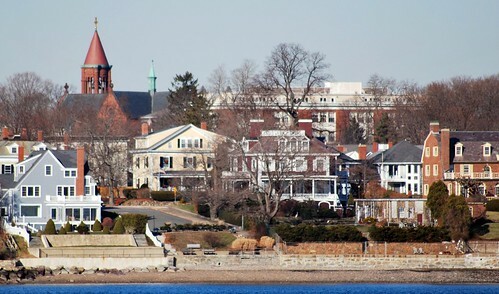 Our first stop took us to Salem Willows Park which is located on a peninsula that juts out into Salem Harbor and from which one can get a really good look at Beverly where Amanda goes to college. Montserrat is a stone's throw from that brick steeple you see in the picture below. 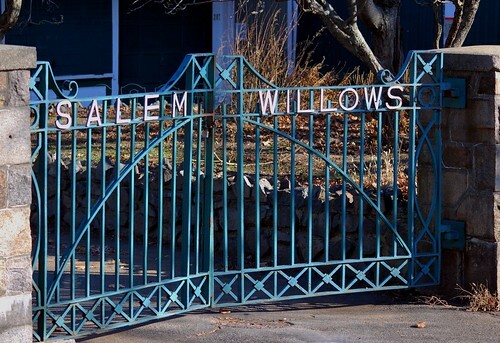 Salem Willows was established as a municipal park way back in 1858 and is named for the European white willow trees that were planted there in 1801; trees which were originally planted there to form a shaded walkway for the patients at a nearby smallpox hospital. "... has a special place in amusement park history. In 1906, Everett Hobbs & William Eaton offered Americans the first ice-cream cone; “Blind Pat” Kenneally introduced Spanish “double-jointed" peanuts to America from his cart at the Willows. A young Duke Ellington played here in 1923; Count Basie and Louis Armstrong performed as well, at the old Charleshurst Ballroom." 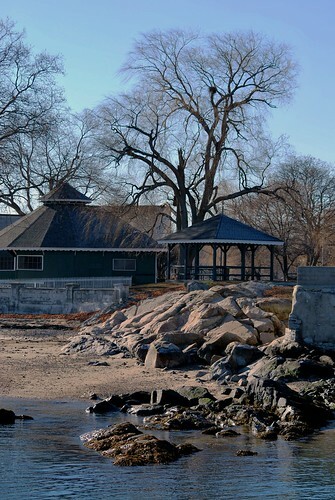 Even though the park has lost of a lot of its old luster and Restaurant Row has given way to take-out joints, Salem Willows is still a very popular place with North Shore residents and I thought it was actually rather pretty in a cold, crisp December way. 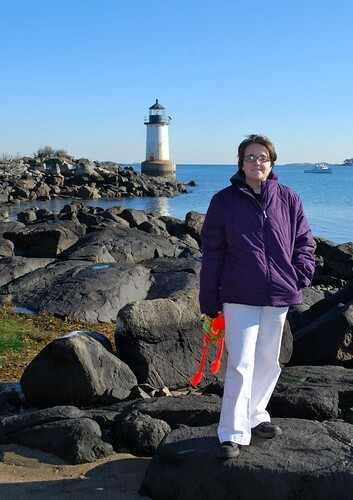 Jamie and I took a walk out onto the abandoned fishing pier that still had some frost left over from the night before so that I could get a picture of Beverly's Hospital Point Lighthouse which sits on the north side of the channel to Salem Harbor across from Salem Willows. Hospital Point Lighthouse was established in 1872 and automated in 1947. 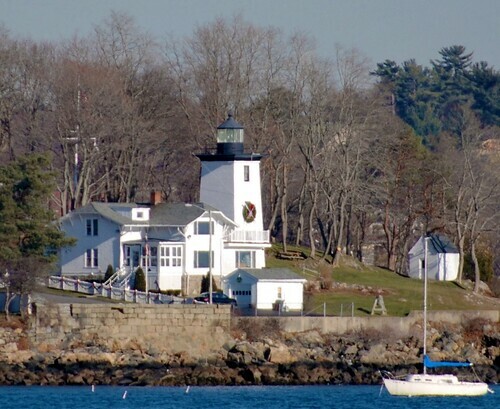 The lighthouse is located on private property which is the home for the commander of the U.S. Coast Guard First District and still uses a 3-1/2 Order Fresnel lens, a rather rare size of light in New England lighthouses. A condensing panel was installed in front of the lens which causes the light to diminish in intensity if a mariner veers from the main channel; the panel is considered unique in American lighthouses. I may actually get to see it in person if I remember to check and see when the U.S. Coast Guard Auxiliary offers open houses in August and September! I couldn't quite put my finger on it but there was something very nostalgic and almost eerie about being out at Salem Willows when it was abandoned of pretty much any living creature other than myself and Jamie; it was almost like I could hear the music from the closed carousel and the laughter of children as they ran in and out amongst the trees. I would have loved to have seen Salem Willows in its heyday! 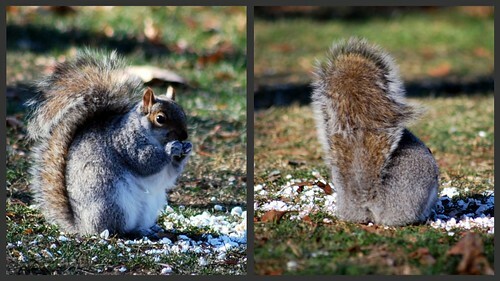 I don't know what all they were eating out there in Salem Willows other than a big supply of popcorn that someone had left for them but those were some of THE fattest squirrels that I've ever seen anywhere and just look at how full that tail is! Those were the type of squirrels that stuffed animals were modeled after! From Salem Willows, Jamie and I then made the short drive over to Winter Island where I knew another lighthouse was waiting to be found. Winter Island was the earliest center of Salem's flourishing fishing industry and is also the home of Fort Pickering which was built in 1643 and frequently rebuilt and repaired over the centuries. Originally known as Fort William, the fort was renamed in 1799 and was manned during the War of 1812, the Spanish-American War, and the Civil War. Remnants of the fort are adjacent to the lighthouse but the morning we were there the entrance was blocked by a big trench dug into the ground and it was a little too cold for me to go climbing over hills and rocks in search of another way to get there. Besides, I had learned my lesson about proper footwear after my incident at Jackson Falls in October and there was no way I was going exploring wearing my current shoes! Fortunately for me, Fort Pickering Light was quite visible from the parking area! Built of iron lined with brick, the lighthouse was built in 1872 at the same time as Hospital Point in Beverly and Salem's Derby Wharf Light which - believe it or not - I didn't go take pictures of! The lighthouse, originally painted red, was built slightly offshore and a 52-foot walkway connected it to the shore. When the Coast Guard left Winter Island in 1969, the lighthouse was replaced by an offshore buoy and it fell into disrepair until a group of concerned citizens and businesses formed the Fort Pickering Light Association in the early 1980s. The lighthouse was refurbished and its foundation was repaired and Fort Pickering Light was relighted in 1983 as a private aid to navigation. The light's original Fifth-Order Fresnel lens was converted to solar power in April 1995 for $2,300 - the cost of which was split by the City of Salem and the Fort Pickering Light Association. 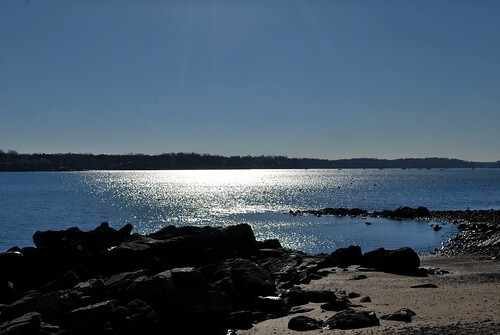 Winter Island is a popular recreational park for residents of Salem with a boat launch, beach, RV & tent camping, etc. but one of the things that I really liked about it were the benches that faced the harbor that were dedicated to various people who must have loved the sea. Several of them were decorated with Christmas wreaths and I couldn't help but think how much they must be missed and still loved by their families. 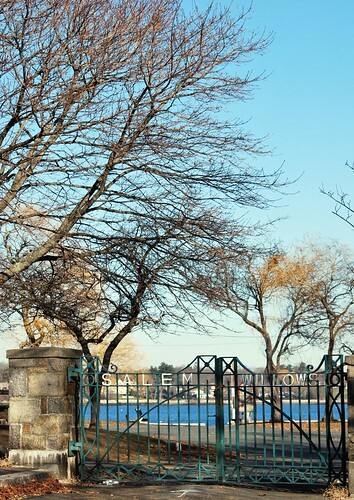 I get the feeling that the people who had those benches dedicated to them loved to sit and watch the water and the sun's play upon it as boats came and went in Salem Harbor and that's why their loved ones chose that spot to memorialize them. To come out at Christmas-time and adorn them with wreaths just seemed like a really nice touch to me. What can I say? I really am a sentimental sap but do me a favor and don't tell anyone else, okay? According to my research, one of the former managers of Winter Island Marine Park, Gary Moore, has called Fort Pickering Light Salem's "Motif No.1" much like that red fishing shack that I posted a picture of long ago in Rockport is theirs and I can certainly see why. Whereas it may not be the prettiest of lighthouses (it really could use a new coat of paint as it's last facelift was back in 1999) it's definitely picturesque and wonder of wonders it's easily accessible! Added to the National Register of Historic Places as Winter Island Historic District and Archeological District in 1994, the entirety of Winter Island has quite the history with "Executioner's Hill" where several hangings took place in the 1800's as well as the site where the frigate Essex was built and launched in the 1790s. In addition to Fort Pickering there are several other old Coast Guard buildings and a self-guided walking tour is available - something that I'd definitely like to go back and do when it's a little warmer than the upper 20's! 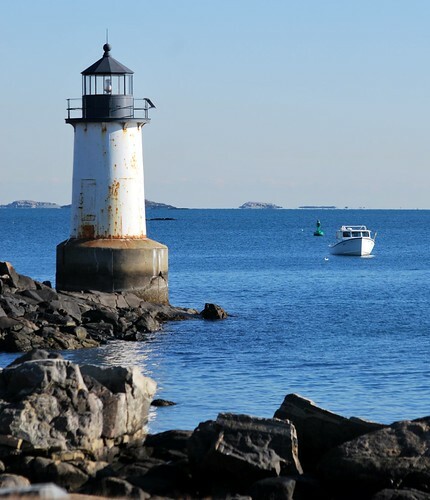 Next post I'll take you to one of the more "different" looking lighthouses on the North Shore and also share a place to eat in Salem that has an interesting history all of its own before I finally wrap up my series on Salem - for this trip! Oh, and before I forget ... time for some shameless self-promotion ... don't forget to check out my new blog Picturing A Moment in Time for my "photo of the day" post - complete with non-moderated comments for your blogging ease! I like the lines of that park gate. Makes me think of a quilting project... LOL! Those squirrels do look a bit plump! those waterfront homes are gorgeous!!! man would i love one of those!!! What Empress Bee said. I want one too. What a great trip that you chronicled very, very well. What I wouldn't give for a waterfront home! Another fantastic trip narrated by yourself, Linda. 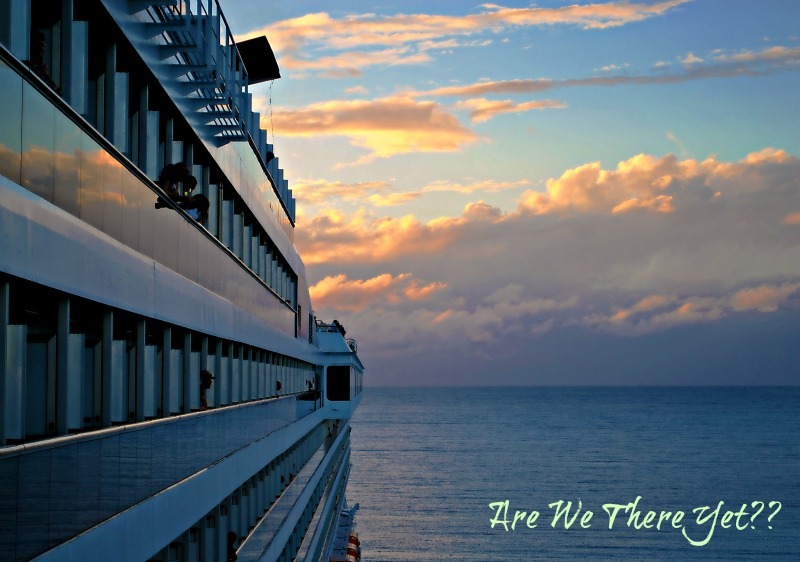 Your photos and commentary are almost as good as actually being there. Srsly. Love it.